People love to tell others what to do. Most kids worth their salt know that regardless of what they want to be when they grow up, they want to be in charge. People tell us where to spend our money, how to behave, what we're worth, where we're going, and whatever else they can tell you before you stop them. Oh, that's right! You can stop them. You can take control and make decisions about what your life is going to look like. Just tell yourself, "If it is to be, it is up to me." It is far too easy to become a passenger in your own life. When you start to feel powerless, it is logical to step back, relinquish control, and let the powers that be take over. It leaves you letting other people make decisions for your life. Fences and dotted lines are drawn to keep you in your area. Many of these fences are staring at us every day, but some are less visible. So what's holding you back from growing into the person you many not even know you want to be? The market crashes and those left with jobs are so grateful for a paycheck that they dare not rustle any feathers. So they start to let decisions get made around them. They keep their heads down and keep moving forward, disrupting as little as they can. And nothing happens. They don't grow. They don't change. They don't take risks. They don't speak up. They don't respond to opportunity. And someone else does. We can't sit by and wait for life to present itself to us. Some of the best ideas have come from people who weren't "supposed" to have ideas. This works on both sides of leadership, among the mentors and mentees. If you are a leader who is not hearing your employees speak up, maybe it's time you changed your approach and ask yourself why they are keeping quiet. There may be a fear of consequence if the idea is not well received, or you may be inadvertently sending your team the message that you make the decisions, so they may as well not bother. Leaders need to create environments that allow people to take responsibility for themselves and encourage determination. If an employee feels that there is a risk of being fired for standing up for themselves, a dangerous situation exists and that employee will never be able to grow. Life doesn't have to be something that just happens to us. Step forward, speak up, and make your own waves. If it is to be, it is up to YOU. 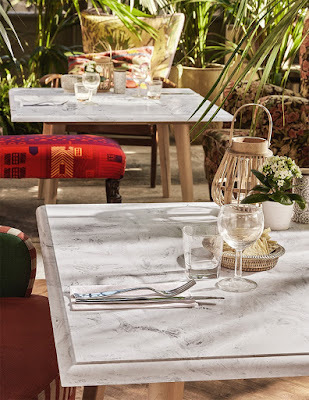 Premium Decorative Surfaces. These three little words are bringing a renewed excitement to the countertop industry. 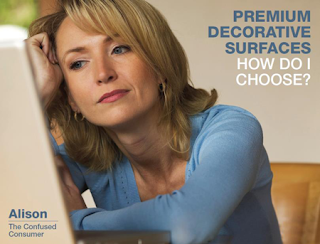 So what arePremium Decorative Surfaces?